Lightweight ladies breeches for the warmer season. Stretch cotton jersey (95% cotton and 5% spandex), 280 gr, tight fitting with self knee patches. Elasticated triangle insert at the ankle. I am very happy with the breeches. The color is lovely. 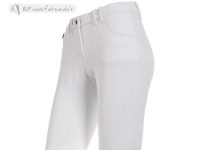 The breeches are great for summer and super comfortable! I will order another color for my spring/summer wardrobe! It arrived in good time, the breeches were a very good price, comfy to wear too. I find the quality is very nice and I'm very satisfied. My drafter is one happy rider with her new summer breeches. I love the Breeches, I hesitated in commenting until I wore and washed them. they have washed well and I will order another pair.